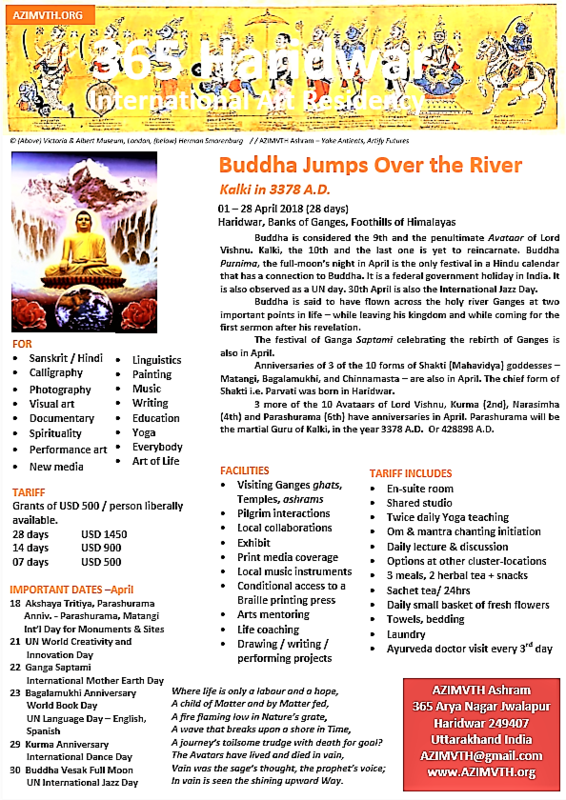 Buddha Jumps Over the River: Kalki in 3378 A.D.
A journey’s toilsome trudge with death for goal? Buddha is considered the 9th and the penultimate Avataar of Lord Vishnu. Kalki, the 10th and the last one is yet to reincarnate. Buddha Purnima, the full-moon’s night in April is the only festival in a Hindu calendar that has a connection to Buddha. It is a federal government holiday in India. It is also observed as a UN day. 30th April is also the International Jazz Day. Buddha is said to have flown across the holy river Ganges at two important points in life – while leaving his kingdom and while coming for the first sermon after his revelation. The festival of Ganga Saptami celebrating the rebirth of Ganges is also in April. Anniversaries of 3 of the 10 forms of Shakti (Mahavidya) goddesses – Matangi, Bagalamukhi, and Chinnamasta – are also in April. The chief form of Shakti i.e. Parvati was born in Haridwar. 3 more of the 10 Avataars of Lord Vishnu, Kurma (2nd), Narasimha (4th) and Parashurama (6th) have anniversaries in April. Parashurama will be the martial Guru of Kalki, in the year 3378 A.D. Or 428898 A.D. Grants of USD 500 / person liberally available. Download a one paged flier as pdf (910 kb) of the residency here and as an image (417 kb) here.